Every individual we offer screening to should have access to the same evidence-based information so they can make a decision that is right for them. The government has a digital first strategy which promotes online information by default and discourages the production of printed information. All the public and patient information about the 11 NHS screening programmes is therefore available online on NHS Choices. 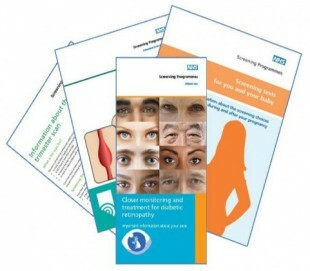 But we produce printed information too because we have a duty to make screening accessible to everyone. For the past 5 years, Harlow Printing Ltd has provided a printing, storage and distribution service for our national screening information leaflets. Local screening services order stock directly from Harlow using an online form. We work closely with Harlow to make sure local services never run out of the leaflets they need. This means people receive the clear, concise and accurate information they require to make an informed decision when we offer screening to them. Like all of us, however, the good folk at Harlow deserve a bit of a break over Christmas and they will be shutting down from Thursday 22 December until Wednesday 4 January. We want to make sure local screening services don't run out of leaflets and Harlow has already made plans for pre-Christmas deliveries to some of its regular large orders. If your service needs to put in any last-minute pre-Christmas leaflet orders, the message is: make sure you get them to Harlow before 20 December. You may also notice a change to the feel of some of our patient information leaflets over the coming months. This is so that we get the best value for money for printing across all 11 national programmes and meet the requirements of the major mailing companies used by local providers.